Blade length : 53.9 cm or 21.22 inches. Sori :1.8cm or 0.70 inches. Width at the hamachi :2.7 cm or 1.06 inches. 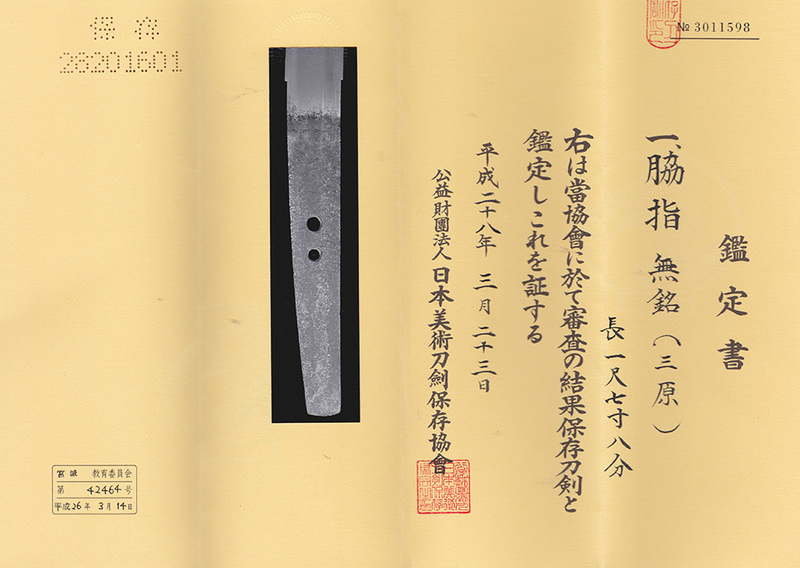 Width at the Kissaki :1.86 cm or 0.73 inches. Kasane : 0.62 cm or 0.24 inches. with jinie attach and shirake utsuri appear. Hamon :Konie deki suguha tightly elegant nice bright and clear hamon. and also hamon are quite similar. started from late Kamakura period to late Muromachi period. from middle to late Muromachi is called Sue mihara school. these templas and shrines made swords for protecting soldiers. This sword has special feature of Yamato school. Saya : Black Ishime-Ji Saya. Tsuba : Mokko shape copper Tsuba, Kiri leaves are engraved. Menuki : flowers are engrvaed with gold color.